Lyle had a passion for the theatre which started in high school and spanned throughout his life. He was able to pass on this passion to Jessica, his beautiful, giving, and kind daughter. 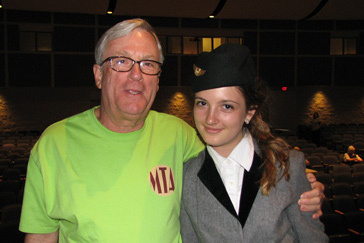 Lyle had the honor of being one of the founding board members of MTA and performed in several MTA productions, two of which he had the thrill to perform with Jessica, Peter Pan and Our Town. Evon, his caring, hard-working wife, and also a Board Member of MTA as well as the Box Office Manager, started a scholarship fund at MTA in Lyle's name which will enable us to provide scholarships for participants who have finanical need and might otherwise not be able to participate. Our goal is to be able to provide one Lyle Kishbaugh Scholarship per show during our 10 show season. Scholarship applicants who would like to apply should write a brief paragraph about why they would like to be considered for the award, explain their financial need, and copy/paste it into the Contact form on our contact page prior to auditions for each production. Scholarship recipients and/or their families will be required to perform an additional 5 hours of volunteer work for the production that they receive a scholarship for. If you would like to contribute to the scholarship fund, you can use the donate button below or mail a check payable to Musical Theatre of Anthem, to 42201 N 41st Drive, Building 1, Anthem, AZ 85086. Please note the "Lyle Kishbaugh Scholarship Fund" and thank you for your support in helping to remember this wonderful man who is dearly missed. A big thank you to the generous people that have already donated to this scholarship fund!